Apple has officially releases it’s all New iPad Mini tablet with high quality software and hardware specifications and interface for its consumers worldwide. Apple iPad Mini is the 4th Generation iPad tablet after the successful released of iPad 1, iPad 2 and iPad 3 devices. Apple made its much awaited announcement regarding its upcoming products including Apple iPad Mini, Apple iPad 4th Gen, Apple MacBook Pro Mini and Apple New iMac with the power of retina display on 23rd October, 2012 in the special Apple Event held at San Jose, California, USA. In this post we will discuss about all New iPad Mini Specifications, New iPad Mini Features, New iPad Mini Hardware and Software Specs and Interface, New iPad Mini Price and Availability and we will also do a short Review of Apple iPad Mini tablet. All new iPad Mini is a true rival and competitor of Google Nexus 7 and Amazon Kindle Fire HD tablet devices which is featuring beautiful 7.9-inch display screen and LED-backlit display with IPS technology and same pixel size of 1024-by-768 resolution at 163 pixels per inch (ppi). iPad Mini will be available in two dual colors of Black & Slate and White & Silver. iPad Mini will be available with the support of both Wi-Fi and 4G LTE Cellular networks with the powerful A5 dual-core chipset processor and 5 megapixel iSight HD backside camera and FaceTime HD front camera with 1080p HD video recording capability and having 10-hour+ battery life. The size of iPad Mini is weighted 0.68lb pounds which is quite thinner and 53% lighter than standard iPad and its 7.2mm thinner and 23% thinner than the standard iPad. iPad Mini also featuring Siri Voice Assistant with the support of iCloud and latest iOS 6 firmware. iPad mini also get ultrafast wireless connection with advanced Wi-Fi technology and LTE networks and over 275,000+ iOS Apps available from the App Store and iPad Mini also have some built-in iOS Apps installed including Safari, Mail, Messages, Photos, FaceTime, Newsstand, Appstore, iTunes, Videos. Maps, Music, Game Center, Photo Booth, Clock, Contacts, Reminders, Calendar, Notes and Camera. The body of Apple iPad Mini is built with truly Aluminum which is best quality of Apple products. iPad Mini will be available with the storage capacity of 16 GB, 32 GB and 64 GB. You can see iPad Mini Full Software and Hardware Technical Spec Chart below for more advanced features and details. Apple iPad Mini version of Wi-Fi connectivity will be available from 2nd November, 2012 in black & slate or white & silver colors. The iPad Mini version of Wi-Fi+Cellular connectivity will be available from mid of November, 2012, while Consumers can start placing Pre-Orders of Apple iPad Mini from 26th October, 2012. Initially the Apple iPad Mini will be launched in selected 34 countries all around the world. Apple iPad Mini will be available for purchasing from 2nd November, 2012 in Apple Store. The all new iPad Mini price will be based according to storage capacity of a device and according to connectivity versions i.e. Wi-Fi version or WiFi+Cellular (4G LTE) version .The official iPad Mini Price is listed below. You can also compare the price of previously released Apple iPad versions including iPad 4, iPad 2 and iPad Mini. 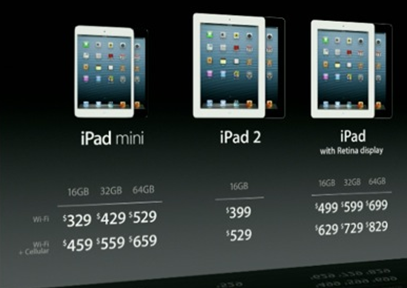 The Price Comparison Chart of iPad Mini, iPad 2 and iPad 4 is available below. Full Technical Specification details of all new iPad Mini can be seen in a chart available below.